Long March of Minhaj Ul Quran is started on Sunday afternoon from Lahore which is leaded by Tahir Ul Qadri. Thousands of people in buses and cars have joined the long march. Long March will be going from Lahore to Islamabad while people from various cities on the path are also expected to join the long march which will increase its size. Long March is going with slow speed so it will take around 24 hours to reach Islamabad. 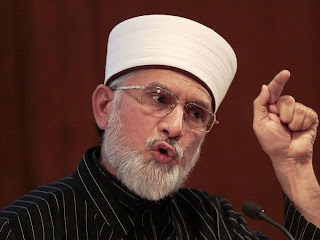 Tahir Ul Qadri has said that we will not leave the Islamabad until the Government agrees to his demands and we are ready to stay there even for many days. No political party has joined the long march of Tahir Ul Qadri. Peoples Party and N League are opposing it strongly while PTI Leadership has said we agree with demands of Tahir Ul Qadri but will not join him in the march. Political analysts are claiming that either Tahir Ul Qadri wants to become Care taker prime minister or he wants another Martial Law in the country.